*Auction 7, Modern Round 2* A stunning and altogether special MJ rookie in immaculate GEM MINT condition. 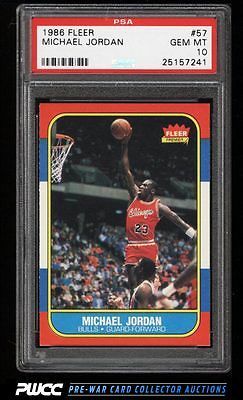 The corner piece of any basketball card collection, the '86 Fleer Jordan stands alone at the pinnacle of blue chip modern cards. An all around wonderful example with deadly sharp corners, exceptional centering and brilliant surfaces. An all around illustrious card which is deserving of the best collection. One of nearly 20,000 cards, lots, and sets up for bid in our 7th Auction of 2016. Click on the link above to view the other PWCC auction lots.